Kim Blacklock of Kent is one of the world’s tallest women, according to the Guinness Book of World Records Kim Blacklock, known locally for her community efforts as President and CEO of HG Fairfield Arts as well as a member of the Putnam County… Please login below or purchase a subscription to the Putnam County Courier to access this content. Registered Democrats and Republicans are being encouraged to get and out and vote next Tuesday, April 19, in New York State’s Presidential Primary – and, for the first time in decades, local votes may sway an election. The names of GOP c… Please login below or purchase a subscription to the Putnam County Courier to access this content. Above: Eric Gross hears the concerns of a student. Below: A school bus crosses the dangerous intersection of Pudding Street and the Taconic. More photos and links to a school video about the situation are online at putnamcountycourier.com. The inters… Please login below or purchase a subscription to the Putnam County Courier to access this content. Procrastinators, listen up! Putnam area residents have three extra days to gather their paperwork and file federal tax returns this year. The tax deadline which would have normally been on Friday, has been extended to Monday, April 18. Taxpayers can… Please login below or purchase a subscription to the Putnam County Courier to access this content. 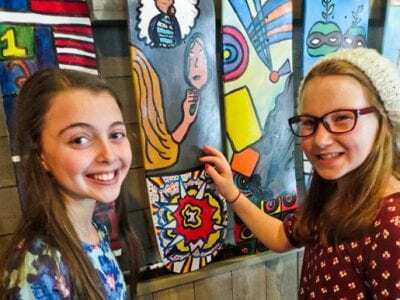 Students Arianna Fisher and Eliana Thompson enjoy browsing through their classmates’ hand-painted skateboards. Rich Parente, proprietor of the Clock Tower Grille in Southeast, believes in his community. For the third consecutive year, the local… Please login below or purchase a subscription to the Putnam County Courier to access this content. 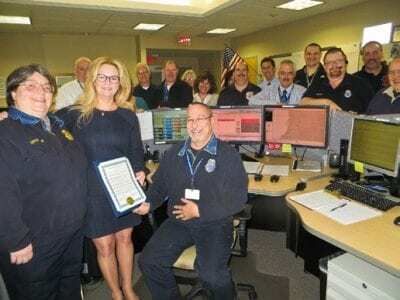 County Executive MaryEllen Odell joins Commissioner of Emergency Services Tony Sutton Tuesday at the Putnam 911 Center to congratulate Putnam’s 911 dispatchers. Putnam County’s 9-1-1 dispatchers are a dedicated group of men and women who … Please login below or purchase a subscription to the Putnam County Courier to access this content. 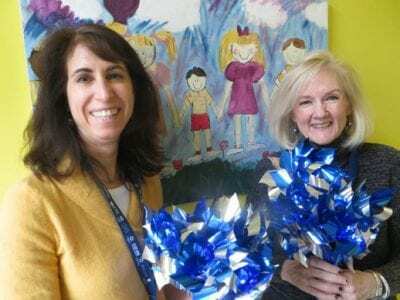 Marla Behler (left) and MaryBeth Ross display pinwheels that will be planted in the Child Abuse Prevention Garden in front of the Sybil Ludington statue in the Putnam County seat on Friday. Residents are being encouraged to visit Lake Gleneida in dow… Please login below or purchase a subscription to the Putnam County Courier to access this content. Richard Doyle, a 56-yearold Mahopac man, charged last summer in Connecticut with multiple counts of animal cruelty as well as witness tampering, now faces new charges for allegedly “maliciously and intentionally torturing and causing wounds&rd… Please login below or purchase a subscription to the Putnam County Courier to access this content. If you have a medicine cabinet full of old medication, you will want to mark your calendar for an upcoming medication take-back day on Saturday, April 23. The Putnam Communities That Care Coalition, in collaboration with the Putnam County Health Dep… Please login below or purchase a subscription to the Putnam County Courier to access this content.